Neither Madras, nor Valley Catholic led by more than five points in Friday's first-round game; VC ends game on 10-2 run to win 60-57. 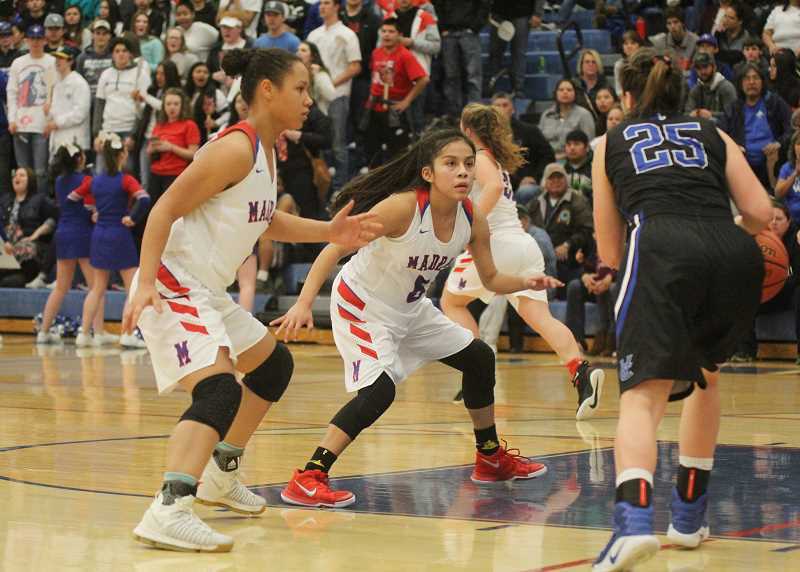 Before Madras faced Valley Catholic in the first round of the 4A girls basketball playoffs Friday, the Lady Buffs had won 14 straight. They were undefeated at home. They were a confident bunch, and, they had their sights set on a return to the 4A state tournament in Forest Grove for the second time in three seasons. The two teams were familiar foes. In 2016, the last team standing between Madras and a state tournament berth was Valley Catholic. The Lady Buffs knocked off the Valiants 63-50 then, and needed a repeat Friday at home in order to get back to Forest Grove. The Lady Buffs pushed their lead to 55-50 at the 2:28 mark in the final period when Kaliyah Iverson drove around a Valiant defender and tossed in a layup. It seemed the Buffs were in great position with a lead and the crowd behind them at home. That was until Valiants junior Callie Kawaguchi took matters into her own hands. Madras missed on three straight possessions, and after Kawaguchi hit both free-throw attempts with 26 seconds remaining, Valley Catholic upped its lead to 60-55. After the Lady Buffs grabbed the rebound and called timeout, they inbounded from the far baseline to senior Lynden Harry, who took a few dribbles and launched a shot from halfcourt that hit backboard with a chance of going in, but it clanked off the front rim. 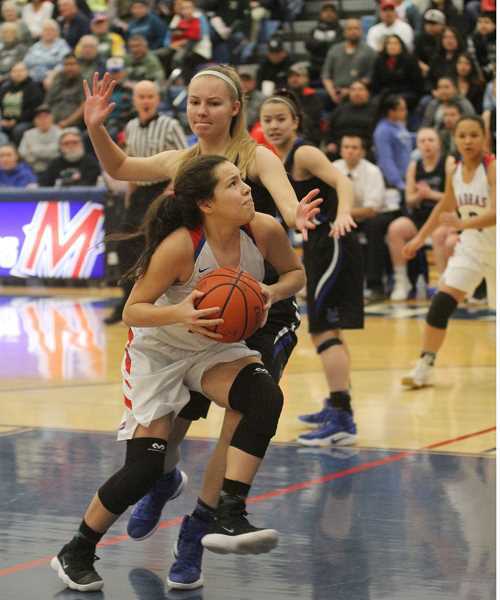 Valley Catholic survived to play another couple games at the state tournament, while Madras (21-3) was dealt its only home loss of the season. Davis gravitated to nearly the same spot on the left elbow, and on successive trips down the floor, Harry found her for three wide open 3-pointers. "I'm very proud of her for stepping up," Harry said. "She's going to be a great player; I can't imagine what she's going to be like her senior year ... She's not scared, she won't back down and she's determined to be the best, and she wants to win." The last one gave Madras a 46-42 edge with 1:21 to in the third period, and prompted to Madras student section to start chanting, "She's a freshman!"